We arrived in Arkhan Valley in time for cow milking. Calves frisked around outside the corral until their mothers were done, and then they were let loose. Great patches of permafrost were pointed out to me as I watched. The valley is remote, far from towns and markets. Just 18 miles from the Russian Buryat Republic border, it has been home to one of 6 guardian communities east of Lake Khuvsgul, allegedly dating back to Chinggis Khan. Their duty was to protect the border. 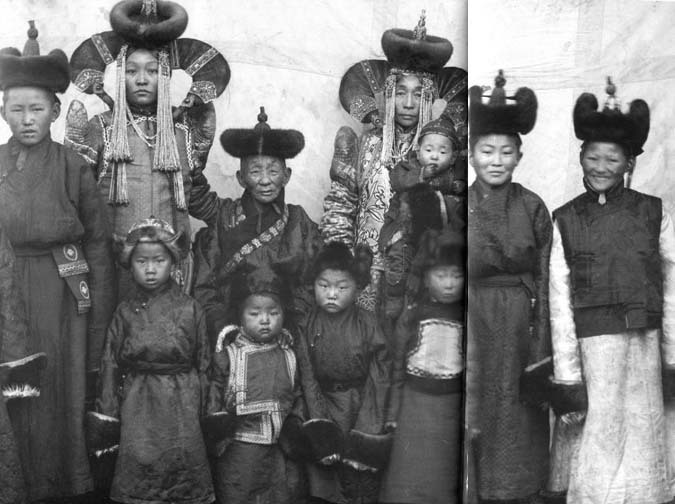 From 10 families in the valley in the 1930s, there are now 3 or 4 families. 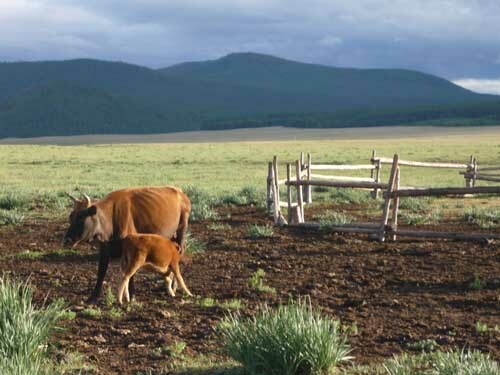 40% of the population herds 34 million head of livestock accounting for 20% of Mongolia’s GDP. Meat is used domestically, but skins, wool, cashmere and leather go to Russia and China. 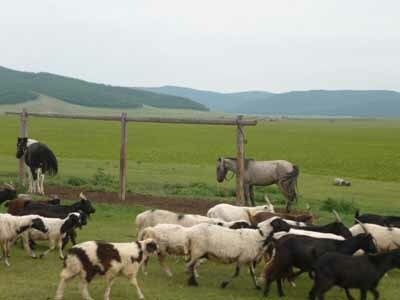 Mongolia exports 6,700 tons of cashmere per year which adds up to 28% of the total world supply; it is second only to China. Wolves, not just harsh weather conditions and disease, are the herders’ dreaded enemy. They hunt in pairs at dawn, or carry out ambushes as a pack. The dogs kept in kennels near the corrals seem friendly enough, but they are fierce fighters. Wolves are still hunted with eagles in Western Mongolia near the Altai Mountains bordering Kazakhstan. That night we enjoyed feasting, vodka and song. A good singalong is invariably part of an evening’s entertainment out on the steppe. My unaccompanied rendition of ‘Ain’t she sweet’ worked out fine – a relief given that I am no pop idol! by Erdenebaatar a.k.a. Curtain in our honour. He had worked in a KGB battalion as a bodyguard for its last two communist leaders before democracy in 1990. He had a military man’s way of walking and standing tall. 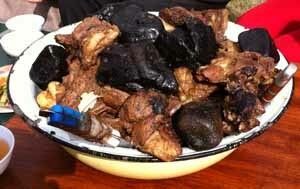 Instead of serving up boiled mutton, he cooked us a special dish: Khorkhog. Stones are thoroughly heated in the fire and then layered with chunks of mutton in a closed metal milk container along with a little water at the bottom. The end result is about as juicy and organic as you can get. 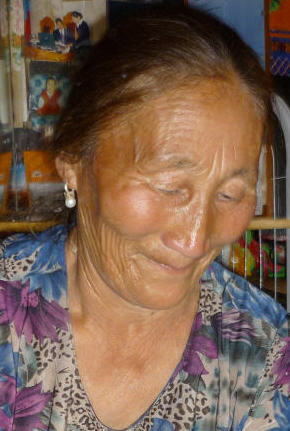 60-year-old Yanjinlkham is the youngest daughter of Sendmaa, heroine of Oyungerel Tsedevdamba & Jeffrey L. Falt’s novel, The Green-Eyed Lama: Love and Betrayal in Mongolia (Grasset & Fasquelle, Paris, 2017). She showed us the wooden chest painted in interlocking patterns by Lama Baasan. 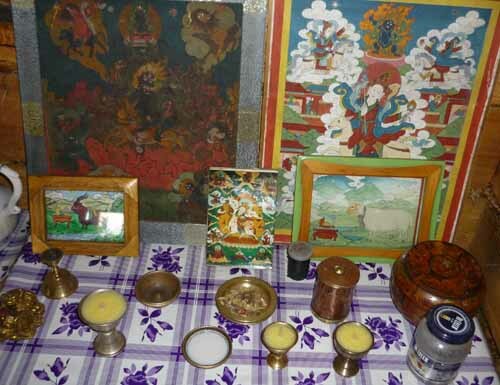 A small shrine (avdar) to the gods was laid out on top − illuminated by butter lamps − including religious icons and images, pictures of consecrated animals, votive offerings of milk, photos of deceased relatives. She also brought out a mandala and a prayer flag painted by Lama Baasan, and some sutras which had been hidden in caves in the hills during the Stalinist purges when he was imprisoned. Americans hailed from northern Mongolia and Siberia, trekking across the Bering Strait to Alaska about 20,000 years ago via a long-gone land bridge. I was told there are distinct parallels between the shamanism of certain peoples of the American north and their Siberian cousins. Keep rollin’, rollin’, rollin’ / Through rain an’ wind an’ weather . . .
We took off for Zerleg Valley where we visited a kindergarten summer school and a 106 year old lady in her ger (tent). We forded the River Uur. 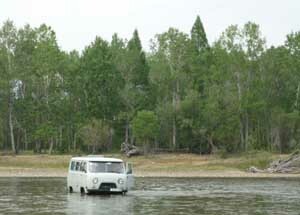 Our vehicles made it across safely, and some of us swam. 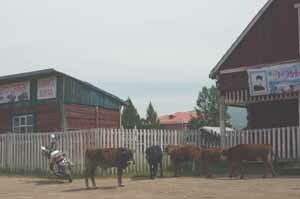 Frisky young bullocks roamed free, and boys on dirt bikes roared by as we drove into town. A shower . . . and an outhouse . . . at last! 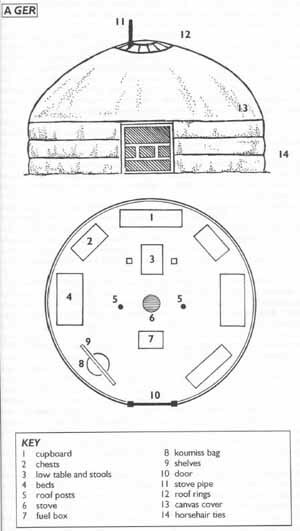 Damdin, his wife Ichinhorloo, and their family welcomed us with more feasting and song in the large well-appointed ger outside their dacha where would sleep in cosy comfort – after our midnight visit to two shamans. A shaman is a healer, priest, herbalist, social worker, mystic and sorcerer; can ward off and battle with evil spirits, or contact the dead. S/he is a bridge between the spirit realm and our human one; and serves their community. Their soul leaves their body and travels up into the sky, or down into the underworld, via trance and ecstasy. Music, dance and words are an all-important part of the ceremony. Spirit is a form of power which makes things happen in our world. People often dread being called by the spirits to become shamans, and resist it, since being given such extraordinary power entails an element of anguish. It is a dangerous profession: there is a risk of madness or death. A shaman’s wisdom comes from second or inner sight. S/he is often blind, as was the case with Shaman Od, the blind shaman of the Arkhan, who features in The Green-eyed Lama. We visited his grandson, Shaman Baatarkhuu, to whom the gift has been passed on. Shaman Baatarkhuu showed us some of his grandfather’s belongings: a drum fringed with blue khadags; an owl-feather head-dress; a special knife; a horse-headed implement; nine coins; a jew’s harp; wooden beads. Shaman Od had been an epic song-singer of fairy and folk tales. 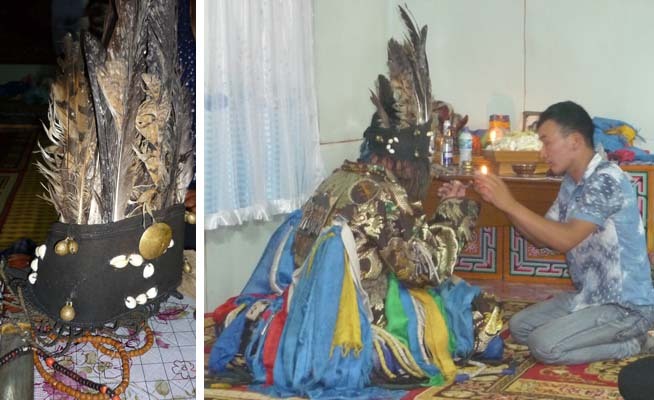 His spirit helper was a bird like the garuda bird of Ulaanbaatar which defeated the poisonous snake, (symbolic of greed and hate blocking the human path to enlightenment). The séance with Shaman Baatarkhuu was an extraordinary experience. Specific things were said which Oyuna (who was interpreting) knew nothing about. I was amazed, and a bit freaked out. Who are we, in the sceptical, materialistic, arrogant West to disbelieve and mock − as did one English friend? 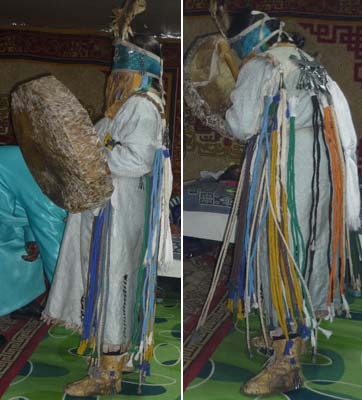 Interestingly, my friends with an African or Middle Eastern background were not so dismissive, but were open about their experiences with shamans or marabouts. 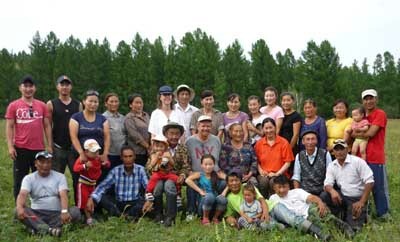 We went on to see Shaman Altantuya, originally from the Darkhad region. 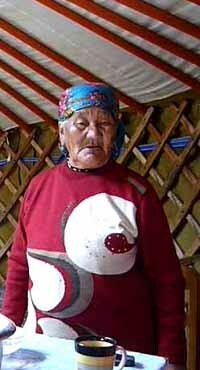 Her grandmother was a Tsaatan, one of the reindeer people of the far north. Initially her grandmother’s spirit visited her in dreams. Then Shaman Altantuya began to speak in someone else’s voice. She went to see the local shaman who told her she had to accept the calling. Her spirit is a reindeer guide as opposed to Shaman Od’s guide being a bird. Byambajau, an 82 year old lady who joined us for late breakfast the following morning, treated us to some throat singing (khuumii) which involves the production of a fundamental pitch, along with a second, and even a third, note over it, simultaneously. The technique uses both the vocal and the vestibular folds (or “false vocal chords”). Byambajau taught herself to throat sing at the age of 16 as she sat watching over the cows grazing on the mountainside. The mouth and tongue are used to form and modulate the melody. When Byambajau tried to sing with music, the musicians could not find the notes to follow her. Any Westerner trying to learn the technique risks destroying their larynx. spirituality of objects in nature is not just in their shape or location, but in their sound as well. So mimicry of nature’s sounds (animals, wind, water) lies at the core of throat singing. We set off across the so-called “sable steppe” for Outegt spring, and a rustic day of haymaking and domestic tasks. Traditionally, thread is made out of animal sinew; rope out of horsehair. Yanjinlkham made me a special horsehair keepsake which was stitched round my cap to remind me of Hiimori the flying horse. I watched mixed butter being made; and the residue of its oil being turned into candles for the household shrine. Yanjinlkham showed us her mother Sendmaa’s shrine; a conflation of Shamanism and Buddhism. 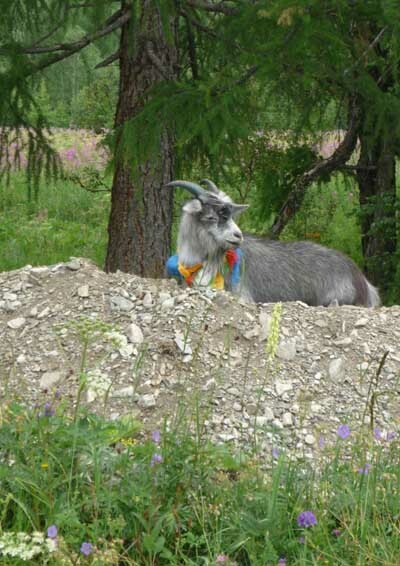 The red goat is the Dayan Deerkh herders’ special god and Jamsran, the red protector, rides him. The sheep transports the glorious goddess. Sendmaa and her husband would ask the gods to protect their children from earthly troubles and misery. 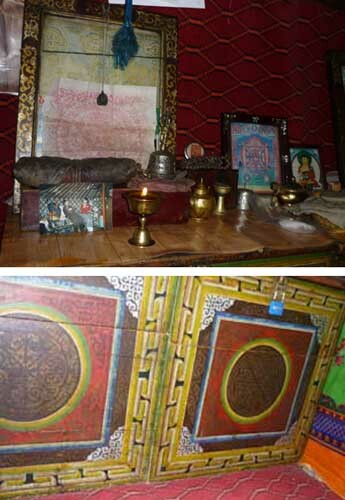 Three treatises belonging to Lama Baasan were wrapped up in silk on a shelf above the shrine. During the purges when ger camps and monasteries were ransacked by Khorloogiin Choibalsan’s Stalinists, what could not be sold was tossed away in to the bushes. Children offered up their findings to the mountains, and stored them in caves. 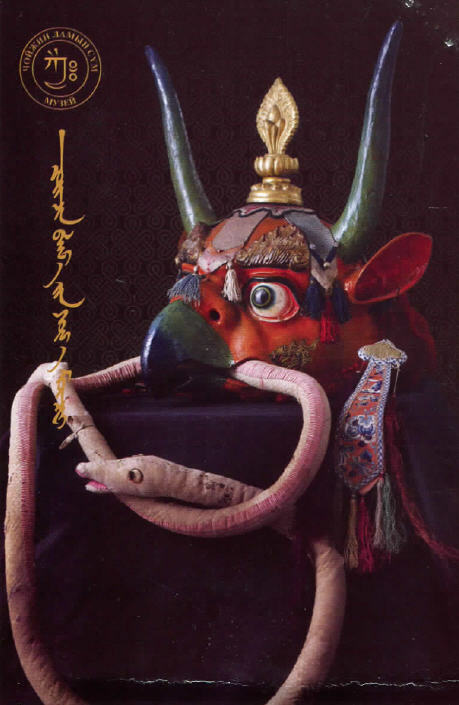 Oyuna remembers playing with religious artifacts as a child and creating imaginary monasteries out of them. She once found a lama hat in which swallows had nested. buckle. As with the Tuareg nomads of the Sahara, ornate saddles, leather bags, jewellery and daggers were, and are still, utilitarian art forms. 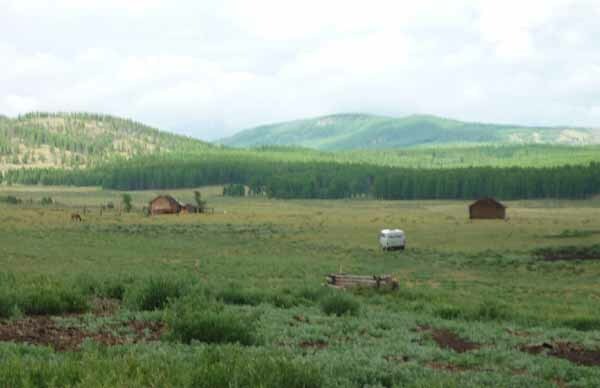 A camp generally consists of a ger or two, alongside a log cabin, and livestock corrals. It can include grandparents, aunts, uncles, and cousins. Their animals are horses and cattle (and in the south, camels) along with sheep and goats. July is sheep-shearing month. 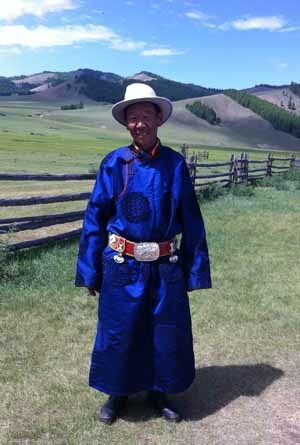 About one third of the Mongolian population is now involved in herding. The rest are in towns or abroad. Bold’s portable, round tent covered with white felt was roomy and comfy. The willow-wood latticework and painted support poles, rafters, roof crown, and furniture were in mint condition. The ger has been honed to perfection over the centuries. Its design is highly symbolic. company what would go down well. I offered: wind up LED torches; picture books (for the kids), felt tip pens and bic biros; fun key rings; pretty hair clips, pins and brooches. 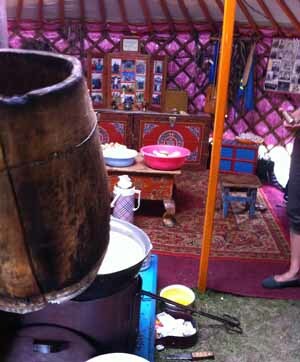 We watched boortsog (bread rolls) and fermented mare’s milk (airag) being made. 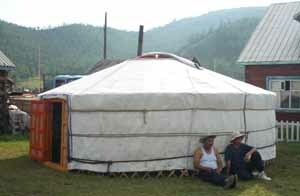 A tent was put up (used by haymakers and for distant herding), and Georgian green tea was made on the open fire. 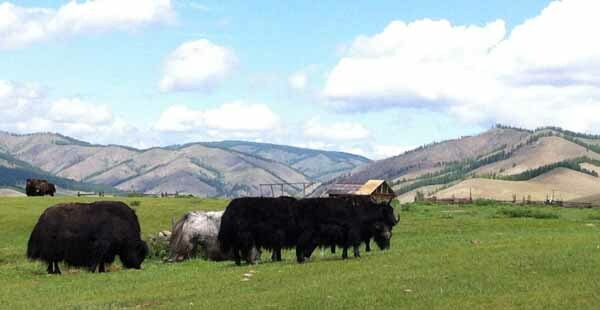 I hung out by the corrals to watch sheep shearing . . .
. . . and admired a superb ox from a safe distance! There was a wrestling contest. #travelwarning : watch the marmot holes when walking (or running) across the steppe! It’s all too easy to trip and sprain an ankle. Tired but still fired up, for the last 48 hours of my trip there was no stopping. 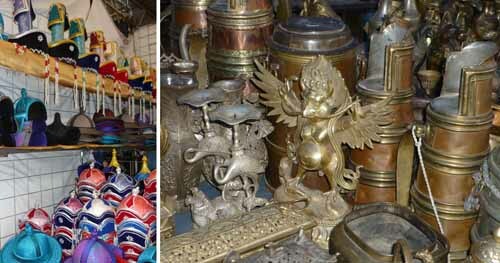 Panoramic Journeys are specialist operators when it comes to arranging trips to Mongolia, Bhutan and Burma Myanmar. They were recommended to me by a friend involved in RISK Productions’ hilarious series, An Idiot Abroad Season 02 The Trans Siberian Railway. I met up with Enkhee and Emily from Panoramic Journeys and our first stop was the Chinggis Khan equestrian statue, a 45-minute drive east of UB. We then hit the Black market, which is how a real market should be. I just hope it does not end up going the way of London’s markets which have been commodified by greedy local authorities to the point of samey blandness . We enjoyed noodles at the Cashmere factory outlet before heading off to Sukhbaatar Square where a huge statue of Chinggis Khan presides over the parliament buildings. 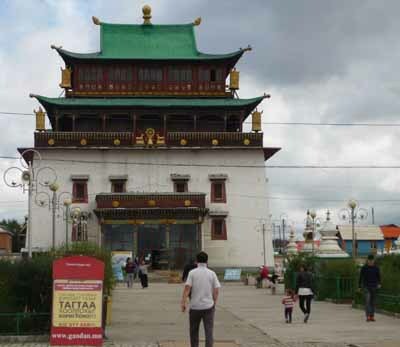 Gandan-tegchinlen Monastery was closed in 1938 at the height of the Stalinist purges, but reopened in 1944. It was the only monastery in Mongolia to function during the Communist era, and one of the very few that escaped destruction. 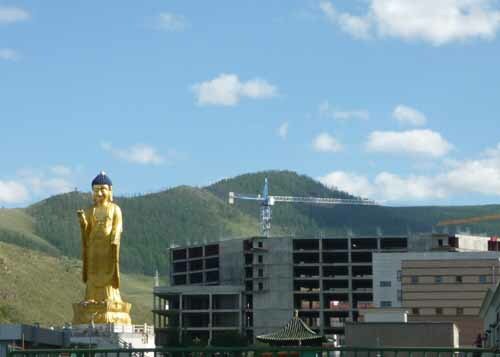 It is the centre of Mongolian Buddhism. The main temple houses an immense, overwhelming statue of Jansreig. The National Museum is well worth a visit. 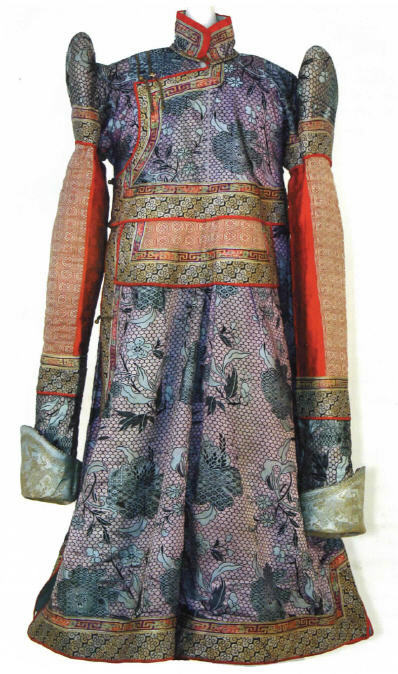 Traditional Mongolian costume incorporating heavy silks and brocades; ornamental silver hair clips joined by strings of precious and semi precious stones of coral and turquoise, or silver chains; heavy-looking ear rings; hair sheaths and tassels; coral and turquoise caps with ear flaps; intricate waist ornaments, silver hair combs with semi precious stones . . . were a strange and gorgeous surprise. Fashionistas take note! 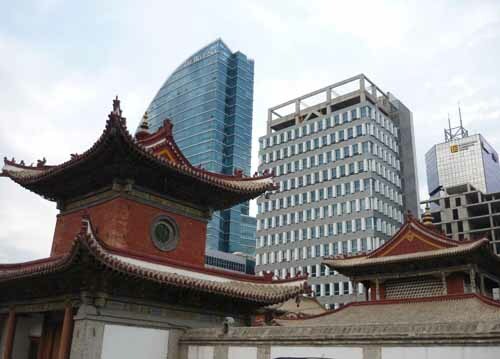 The high points of the day in terms of Buddhist art and culture were the Zanabazar Fine Art Museum, and the Choijin Lama Temple with its superb collection of religious relics and Tsam dance masks. It’s worth having a drink at the five-star Shangri-La Hotel in Sukhbaatar District to people-watch boom-time Mongolians at work and at play. Our last supper was at Guantanamera restaurant down the road from uber-chic Continental Hotel. Each to their Shangri-La: be it an ancient shamanic wilderness; an earthly Buddhist paradise; or a land of new business opportunities. 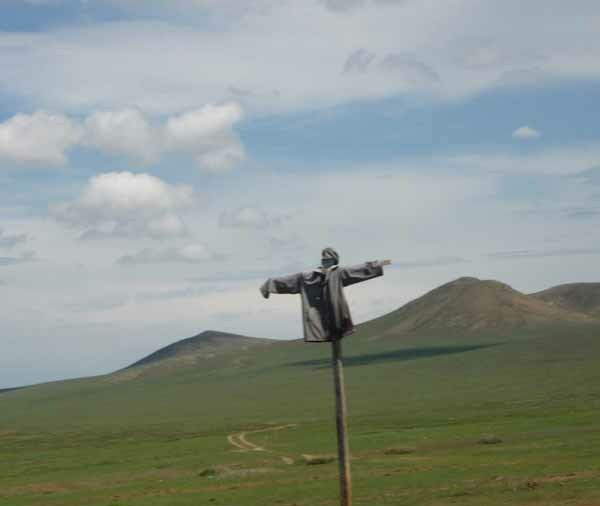 Mongolia has it all. I long to go back. © Georgia de Chamberet for The BookBlast Diary, 2016 c/o BookBlast Ltd, London. All rights reserved. The photographs by Georgia de Chamberet are copyright material. They may only be used for associated online reports about this post and must be clearly credited. It is not permitted to change them, to add to them, reproduce or modify them in any other way. In case of violation, we reserve the right to withdraw the right of use and claim damages. Unless otherwise specified, the content herein is only for your personal and non-commercial use.